Description: Thallus filiform, olive when young, brownish when older, in tufts to 120 mm long. 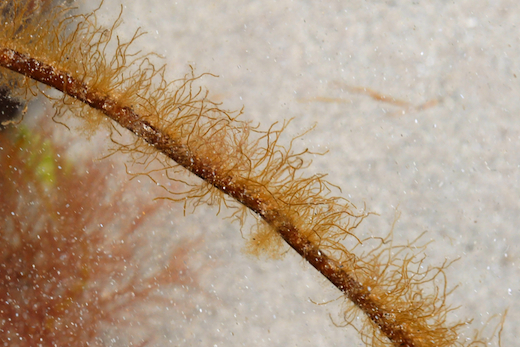 Filaments unbranched, 0.25-1mm diameter. Thallus mainly parenchymatous, uniseriate near the base. Parenchymatous parts differentiaed into medulla and epidermis; older parts of the frond become hollow. Haris abundant. Many discoid chloroplasts per cell. Unilocular sporangia developed from the the outer epidermal cells; plurilocular sporangia multiseriate, also developed from the outer epidermal cells. Habitat: Lower intertidal, epiphytic on the brown alga Chorda filum. Site © M.D. Guiry 2000 - 2019. Important copyright notice: all text, design and photographs on this site are copyrighted by M.D. Guiry unless otherwise stated and all rights are strictly reserved. Click here for copyright information and contact. Website design: 249 Design Studio. Site maintained by M.D. Guiry (michael.guiry@nuigalway.ie). There have been 8736824 page loads since 1 January 2014 on 25 April 2019.